Swimming is a good way to improve and maintain your fitness levels, but it requires good breathing techniques and efficient lung function. You might have difficulty breathing while swimming at different times during your life. Having difficulty breathing has different fitness and health implications, depending on your age and on your ability as a swimmer. Water is denser than air and it compresses your chest somewhat. You must make an effort to exhale under water. 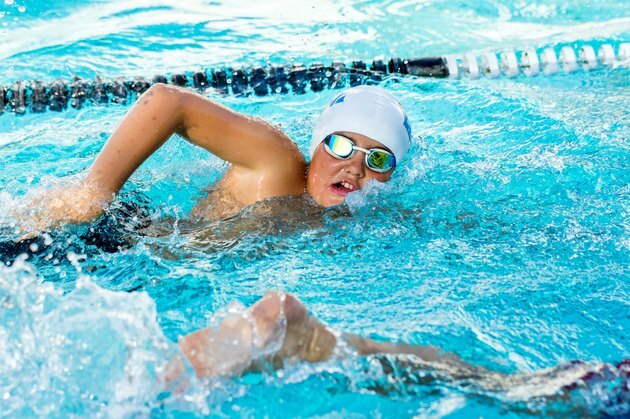 The feeling of constriction distresses some novice swimmers, but once you build confidence, you lessen the likelihood of hyperventilating or holding your breath as a reaction to stress. Blowing out air in the water slowly, immediately after inhaling, gives you some sense of control. Easy and steady breathing ensures an adequate oxygen supply, which is critical for continued motion and aerobic metabolism. In order to breath with ease, you must improve your stroke and breathing technique. You rotate your body in the direction you intend to breathe, which puts your head in the right position to take a breath, just above the surface of the water. Do not strain to lift your head out of the water or wait to exhale just before you breathe in, as you will tire and have difficulty taking a full breath. Timing your breathing is also important, particularly swimming freestyle. Take your breath just as your stroke arm leaves the water at your hip, to make its “recovery” back in front of you. Difficulty catching your breath after a particularly intense set might only mean you need better conditioning. Hypoxic or breath-control training is helpful for younger racers training to withstand race conditions, but the benefits are not so clear for older swimmers. Increased lung function, instead, comes with steady and continued workouts. Challenge yourself to increase your pace, and work with a coach in a team setting to develop in a safe and structured environment. Always pay attention to sudden or unexpected changes in your breathing patterns. Asthma makes breathing difficult. Exercise-induced asthma can result from an aggravation of an existing condition, or from sensitivity to the chemicals used in, and produced by, the pool disinfection process, says Mary Pohlmann MD, member of the USMS Sports Medicine Committee. Medicines help alleviate and prevent asthma symptoms from occurring. Cardiovascular problems also cause feelings of breathlessness, according to the Merck Manual. Dyspnea or breathing distress is more severe than the typical feeling of being "out of breath" after a sprint. Lung damage due to smoking is another cause of having difficulty breathing while swimming. Anemia caused by vitamin deficiency and other conditions can also result in you having difficulty breathing or getting enough air.